Our new teacher arrived last week! 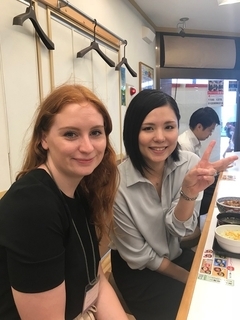 Last week our new native English teacher, Scarlett, joined Seiritsu. We met her at the orientation in Shinjuku and have started to help her get settled. On the first day we took her to her first 牛丼 lunch. Her first few days in Japan and she gets welcomed by a typhoon! This is just the beginning of her adventures. Good luck! !